Employment Law | Labor Lawyers | Milwaukee WI | Lindner & Marsack, S.C. 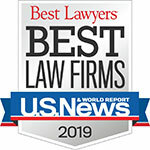 Founded in 1908, and specializing solely in representing management in labor and employment law matters, Lindner & Marsack, S.C. is highly regarded by clients and colleagues alike for our experience, dedication and expertise in labor and employment law. Solving employers' toughest workplace legal challenges – across the United States and in a wide variety of industries – is all we do.